Over time, your tiled floor surfaces and tile floors and sealer lose lustre and shine. Washing, mopping, and scrubbing does not help remove the dirt and grime and give it a clean finish. Grout is a porous material that absorbs all dirt, grime, and debris on the surface. When you mop, and wash you get rid of the dirt on the surface but not the impregnating dirt deep in the tile. Our tile and grout cleaning in Sydney team can help restore your tiled floor and sealer as good as they were when you first installed it. For tile cleaning in Sydney, and tile grout cleaning in Sydney, our tile and grout cleaners in Sydney use quality grout sealer and sealing products that are effective and helps maintain the floor to look great for months. As part of the tile cleaning and sealing service that we extend to our customers’ in and around the Sydney CBD and North Sydney areas, the seal, and sealers also make it easy for you to maintain your floors. This is because when sealers are used effectively to help seal the gaps in between the tiles, then dirt doesn’t seep in easily. Tiles lose luster after months of regular foot traffic. And that is why tiles need to be cleaned and a wash will bring back the discolored tiles back to life. Many a time, tiled surfaces tend to look dull even after regular cleaning and washing. Our tile cleaning Sydney cleaners have the know-how and use a microfiber cloth to have the tiles cleaned and make it look all shiny and sparkling. Our cleaner and washer are equipped with the latest equipment so as to effectively remove the impregnating dirt that is embedded on the tiles and it has gotten discolored owing to not regularly having it cleaned and even with a round of washing and mopping sometimes it cannot look all clean nor have the dirt effectively removed. Most people will take a toothbrush and a bottle of cleaning solution and try to clean and scrub away the dirt. This is not effective. You will waste a lot of time on the floor and still the results will be disappointing. A stronger cleaning method is the only way to truly sport cleaner tiles and grout. If you were to ask a washer or cleaner, they would say that they do rely on a microfiber cloth to help give the tiles a clean, shiny look. 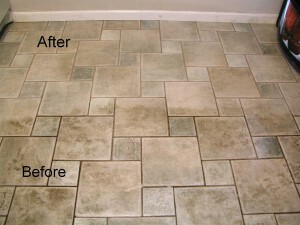 Extending the life of your tiles by removing debris, dirt, and grime that weaken tiles. Do away with the need to recolor the grout to make it look brighter. All your tiled areas including the baths, kitchens, and countertops are disinfected from disease-causing pathogens. We periodically replace the existing sealers and seal the tiles again. We will carry out any cleaning service at short notice or even if you need it done on an emergency basis. Basically, an immediate emergency cleaning is something that we offer. Our price is cost-effective and cheap. Our price being cheap does not discount in any way the quality of our work. Why are we the leading tile and grout cleaning Sydney Company? We use a microfiber cloth and high-powered specialized tile and grout cleaning equipment and cleaning agents to remove dirt that is hidden deep inside the grout. Our tile cleaning Sydney teams know very well that grout that is improperly cleaned and not regularly cleaned becomes permanently discolored. It can only be restored by coloring and still does not look as good as the original color and is not shiny. Our cheap tile and grout cleaning service in Sydney handles a variety of tiles including porcelain, ceramic, limestone, travertine, limestone, cement, granite and many more. Never opt to go with tile cleaners whose quality of service is not guaranteed. Call our cleaners today for a regular or emergency wash so as to help remove impregnating dirt and for you to have a fresh and clean home. So anytime you want an emergency or a planned tile sealing, grout cleaning and washing, the cleaning services company Franklean Carpet & Tile Cleaning has on board an experienced cleaner and washer who will take care of tiles sealing, and will help clean any impregnating dirt, and grime on discoloured tiles. And most of all, our price for adding in sealers, getting the tiles cleaned is cheap and pocket-friendly. So if you reside, in the North Sydney or Sydney CBD areas, then we can help serve you. To know our quotes or price, contact us at anytime. We are reachable on 0411 181 990 or email us at frankleansyd@gmail.com.